Welcome to Dera Indian Takeaway in Dublin 1! 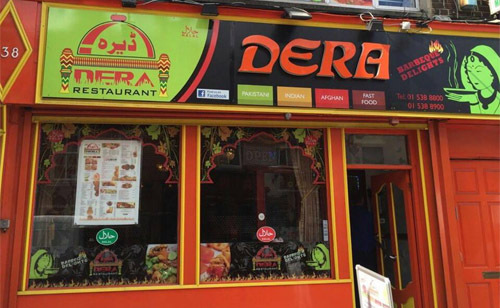 Dera Takeaway and Restaurant is located in the centre of Dublin on Parnell Street. This Dublin 1 Takeaway introduces real traditional desi Pakistani Indian food to its takeaway customers in Dublin. Dera Takeaway in Dublin 1 is a popular takeaway in Dublin 1 offering a variety of traditional dishes including Pakistani, Indian, Fastfood and Afghan. Dishes available include starters like Chicken Malai Tikka or a Mixed Meat platter. Main courses include Lamb Chop Masala our hot and spicy dish Prawn Chilli Masala. All dishes are cooked using 100% fresh Halal meats. Order online now using our new Website and App at www.deradublin.com. You can collect your food at our takeaway or have you food delivered and pay by cash or credit card. 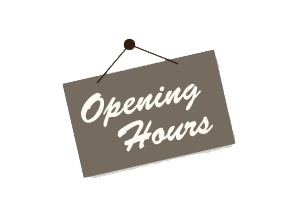 We are open Monday to Sunday from 1.00pm to 11.45pm. Our Takeaway in Dublin 1 delivers 7 days a week from 1.00pm to 11.45pm. Delivery Cost is from €2.00.
" I went here from a recommendation from a friend. Was not expecting the standard of food we received. The place was not only wonderfully decorated in traditional decor, the staff were very friendly the food was amazing. The samosas my boyfriend ordered although I don't eat lamb the sauce they came in was one of the most delicious dressings I have ever tasted I nearly wanted to start eating lamb! Every thing was fresh and so authentic! Great value for money also. Am delighted I found out about this little gem and extra happy that it is very close to home will be visiting often.
" We ordered in for dinner, first time and we go a very nice experience. The food was lovely and the service excellent within an hour. I asked for an additional sauce and I got it for free with some salad and papadum. Good price and quality. Highly recommended.
" We had a really nice dinner here at the Dera Restaurant. The food is really genuine good food! Great value for you money. Also lot's of people came to order take away :-)! The staff were very friendly!